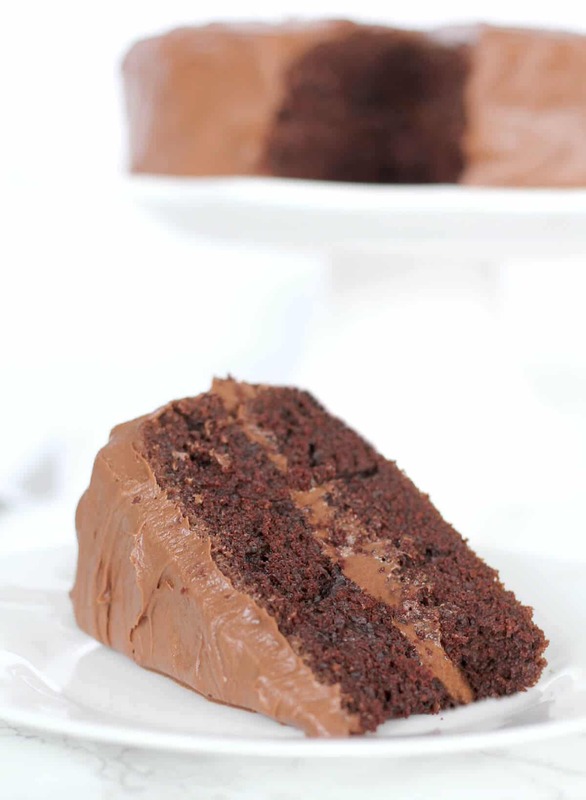 The best chocolate cake made with Hershey’s cocoa is a full-flavored chocolate layer cake with a chocolate cream cheese frosting! And it’s one-bowl easy! When I was growing up, my Mama would ask me what kind of cake I wanted for my birthday and every year my answer was the same: CHOCOLATE. Back then, Mama would make the best homemade chocolate cake from a recipe in a small, paperback Hershey’s cookbook. 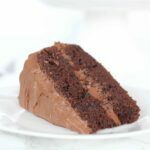 That recipe hasn’t changed much, and it’s the basis for this recipe—and I still think it’s the best chocolate cake! As much as I love it, I rarely order chocolate cake in restaurants. 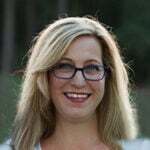 Even the best restaurants usually serve a slightly dry chocolate cake and I cannot stand that. So with this recipe, I use vegetable oil and butter as well as an extra egg yolk to ensure the cake is moist and tender and not at all dry. What I love about this cake is that it’s so easy. And although throwing everything in one bowl to mix up a cake seems a little counter-intuitive to the precise nature of cake-making, it works so well for this cake that I don’t know why we don’t use this method for every cake! It’s literally all made in one bowl. I even forgot about wanting to include butter, so I added softened butter to the batter without creaming the butter first, which goes to show that we’ve somehow created a convoluted, unnecessary process to making cakes. However, I’m not brave enough to try this method with every cake. There’s too much work involved with other cakes to take a chance on wasting the effort. With this one though, you can rest assured that you almost cannot mess this cake up. You start by stirring together all the dry ingredients in a large bowl and then adding the wet: eggs, milk, oil, butter, and vanilla. Then you stir in boiling water and I added the extra step of pouring the boiling water over used coffee grinds. This does not make the cake taste like coffee, I promise. What it does is similar to what salt does to soups or any food. The minute amount of coffee derived from pouring water over the coffee grinds simply elevates and brings out the chocolate. Try it—I promise it’s good! 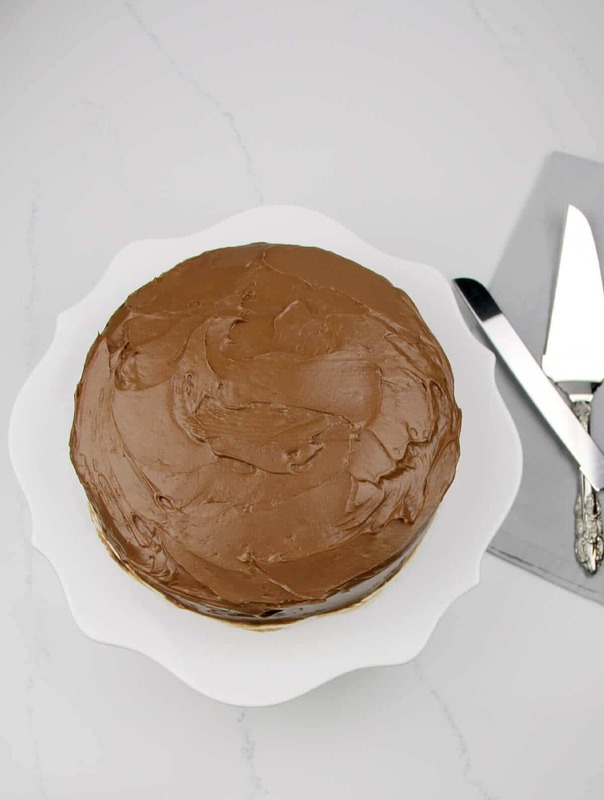 I suggest frosting this chocolate cake with my favorite Chocolate Cream Cheese Frosting or Perfect Chocolate Buttercream Frosting. Enjoy! The best chocolate cake made with Hershey's cocoa is a full-flavored chocolate layer cake with a chocolate cream cheese frosting! And it's one-bowl easy! Preheat oven to 350°F. Butter two 9-inch round baking pans and line with parchment paper. Butter and flour the parchment paper. Stir together sugar, flour, cocoa, baking powder, baking soda, and salt in bowl of stand mixer. Add eggs, half-and-half, 1/4 cup water, oil, and vanilla. Beat on medium speed of mixer for a minute or two, scraping down the sides every few seconds, then add the softened butter. Beat on medium to medium-high speed of mixer until well blended. Scrape the sides and mix well. Note: The butter will not be completely mixed in until you pour in the boiling water in the next step, so for now you will still see pieces of butter. Just get it as well-blended here as you can. Place used coffee grounds in a fine mesh strainer set over a measuring cup. Pour boiling water over coffee grounds to 1 cup mark. Stir coffee-water into cake batter. Pour batter (batter will be thin) into prepared pans. Bake 30-35 minutes or until tester inserted in center comes out clean. Remove pans from oven and cool for 10 minutes. Remove cake from pans to wire racks and cool completely. The original recipe calls for 1 cup of milk, which I rarely have. I do always have half-and-half for our coffee though so I substituted 3/4 cup of half-and-half mixed with 1/4 cup of water. I'm so pleased with the moistness and texture of the cake that I don't plan to use regular milk and will stay with this combination, but if you only have milk that will probably be just fine. I would only use whole milk though, not low-fat. 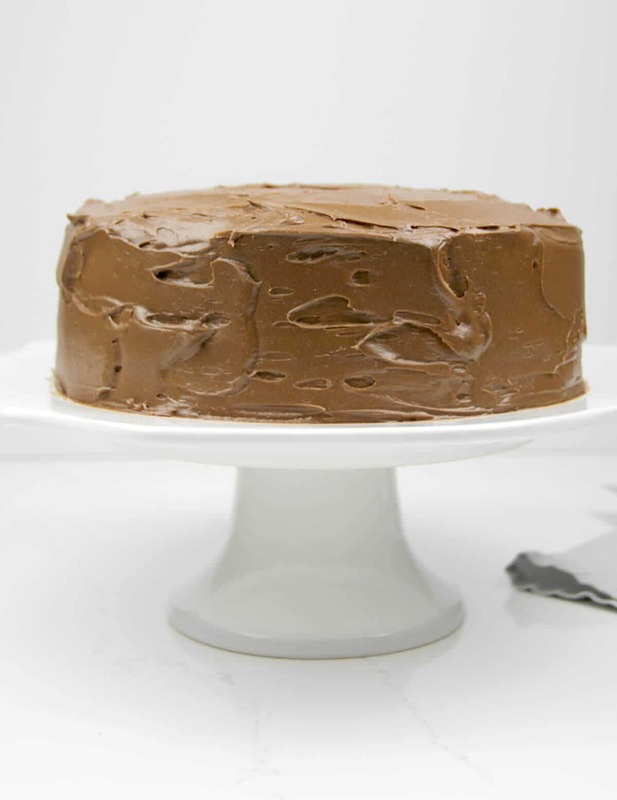 Recipe adapted from Hershey’s Perfectly Chocolate Chocolate Cake and Hershey’s Old-fashioned Chocolate Cake.